Brad Amos is a biologist and a designer of optical instruments. A boyhood visit to the Plymouth Lab of the Marine Biological Association in the late ’50s led him to study Zoology at Oxford and then to do a PhD at Cambridge on the contraction of Vorticella, a microscopic pond organism. In this organism, he discovered and named an abundant calcium-binding protein which is now known as centrin and has been found in all cells. In 1981 he moved informally to the LMB , where he found that John White had set up a prototype confocal microscope. With John, Mick Fordham and Richard Durbin, he developed the confocal microscope which was taken up by Bio-Rad and was soon in use in labs throughout the world. Brad was seconded to Bio-Rad by the MRC for the next 17 years, and designed both the Radiance series of confocal microscopes and the production line jigs for manufacturing it. When the UK factory was acquired and closed by Zeiss he continued to design optical equipment for use in the LMB and to organise a course on advanced optical microscopy in Plymouth which is now in its eleventh year. Since retirement in 2010 he has been working part-time in the University of Strathclyde on new types of microscope, using his ‘Mesolens’ and collaborating in published work on nonlinear optics and novel lasers. He has retained his interest in marine and freshwater biology and has also written papers on gem faceting and invented a method for the measurement of refractive indices in gemstones (including diamond) where the index is too high for a conventional refractometer. The Mesolens is a giant microscope objective designed for computer data acquisition rather than the human eye. It arose from a realization in the early days of confocal microscopy that confocal images could not be obtained of large specimens, because the available low-magnification objectives had too poor a resolution in depth. With the help of a professional lens designer, a series of multi-immersion lens designs have been created with numerical apertures of nearly 0.5 at a magnification of 4x and field sizes of around 5mm diameter. This specification was chosen to facilitate the screening of human genes in transgenic mouse embryos but might also aid simultaneous observation of large numbers of neurones in the brain. A recent form of Mesolens has been developed into a laser scanning microscope in a collaboration with Professor Gail McConnell , Dr John Dempster and others in the University of Strathclyde. With this team it has proved possible to record simultaneously cytology and whole-animal anatomy confocally in large specimens such as 10-day mouse embryos. A test centre for Mesoscopy was set up in Strathclyde during 2013 and is now producing spectacular results (see http://www.strathclydemesolab.com/) . These results show that mesoscopy closes a gap in the repertoire of the optical microscope: provided the resolution (0.5um in length and 3um depth) is adequate the Mesolens is capable of gathering approximately a hundred times the amount of information in a focal series that can be gathered by a standard N.A. 1.4 60x microscope lens, with proportionally enlarged file sizes. In 2002, Brad founded an annual course on Advanced Optical Microscopy in the Laboratory of the Marine Biological Association in Plymouth UK. This annual course is now widely known and attracts students and lecturers from all over Europe and beyond. Many LMB students and post-docs have attended this course. The next course is planned for March 2018. 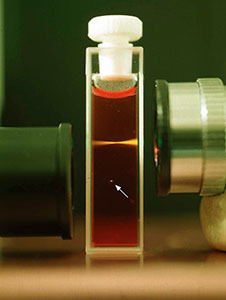 Single and double photon excitation of fluorescence (photographed by W.B. Amos and M.Cipollone in the LMB. 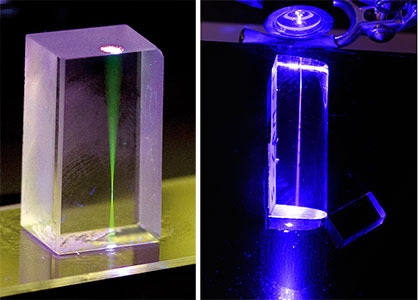 Testing glass for the macrolens, using a violet laser. Brewster conoscopy as a method for measuring high refractive index of gemstones. How the confocal laser scanning microscope entered biological research.